May is National Pet Cancer Awareness Month. While the diagnosis of cancer can be very heartbreaking, we wanted to shed light on some happy stories that will hopefully show the sheer strength and will power dogs can have. While hearing the word cancer might seem scary, hopefully these stories will give you some faith. A dog’s strength is truly incredible, and these ten stories of dogs surviving cancer are proof. Molly the Labrador was abused and neglected. She had serious medical conditions that her owners were not taking care of. She was rescued just in time by the Southern California Lab Rescue. She was overweight, missing fur, and her ears had fly bites. Thankfully they fixed her all up, but they discovered a bump in her neck which was cancer. After everything Molly has overcome, she is one of the happiest dogs you’ll meet. She is now in remission and is at a healthy weight. Now that Molly has beat cancer, she has become a therapy dog for cancer patients. Molly has found her calling and after healing herself, she can now help others heal too. Beni is eleven years old and has survived cancer, even at his age. His owner found a lump in his groin and took him to the vet, who diagnosed it as lymphoma. Within one night of treatment his cancer started to reduce. After twenty six weeks of treatment, Beni was in remission for five months after that. When they first brought Beni in it looked like he would only have two weeks to live. A year and a half later Beni is still with us and doing better than ever. People are shocked when they find out he is eleven years old because he acts like a puppy. Lily the Golden Retriever had a tumor on her spleen. Without a blood transfusion she would have been dead in hours. After an emergency surgery it was discovered she had Hermangiosarcoma, which is very common in Golden Retrievers. Without surgery she would not make it, but with surgery there was still only a ten percent chance that it would be benign and she would only live a few months. Her owners decided to take the risk and in the end it was the best decision they ever made. Lily ended up being in the ten percent category and it is obvious from this video she is ecstatic about it. Her owners never gave up, and neither did Lily. Vader the Rottweiler started limping one day, so his owner brought him into the vet. They discovered Vader had Osteosarcoma cancer in his right front leg. The options were to amputate his leg, or he would have one to two months to live. It was not an easy decision because his owner was scared of how Vader would do with just three legs, but he put his trust in the hands of doctors. Dogs with amputations can live mostly normal lives. Within twenty four hours of his surgery, Vader was already running up and down the stairs. After surgery, Vader went through chemotherapy and is doing better than ever. Macha at two years old was diagnosed with Canine Lymphoma. Immediately she was taken into surgery, even without having an appointment. After recovering from surgery she was treated with chemotherapy for about a year and a half. When Macha first came to the hospital it looked like she didn’t have much chance at survival at all. A year and a half later it’s a completely different story. Macha’s story is a true story of survival. She never gave up and neither did her doctors. With help from the Morris Animal Foundation Macha was given a new lease on life. Sassy, a six year old American Boxer Staffordshire mix is joined at the hip with her owner Paulette. Paulette had severe back pain and depression, so at the suggestion of her doctor she got a dog. Sassy has helped Paulette overcome her issues, and now Paulette has returned the favor. Sassy had a lump on her neck, and it turned out to be cancer. It was an aggressive type of cancer and if no treatment was done she would only have about two years to live. Paulette needed Sassy for emotional and physical support and did everything she could to get her treatment. Sassy got surgery and it not only saved her life, but it also saved Paulette’s. Ethel the Bloodhound works as a K9 officer for the Rutherford County Sheriff’s Office. She works every day to help save lives with her powerful sense of smell, but this time it was her life that needed saving. Ethel developed a lump on her nose and it turned out to be a stage 1 cancerous tumor. After undergoing sixteen treatments, with the support of the community Ethel is now on the mend. She is now in remission and her trainer is grateful to have his partner in crime back. Conrad is a longtime pet therapy dog at the UF Health Cancer Center in Orlando, Florida. 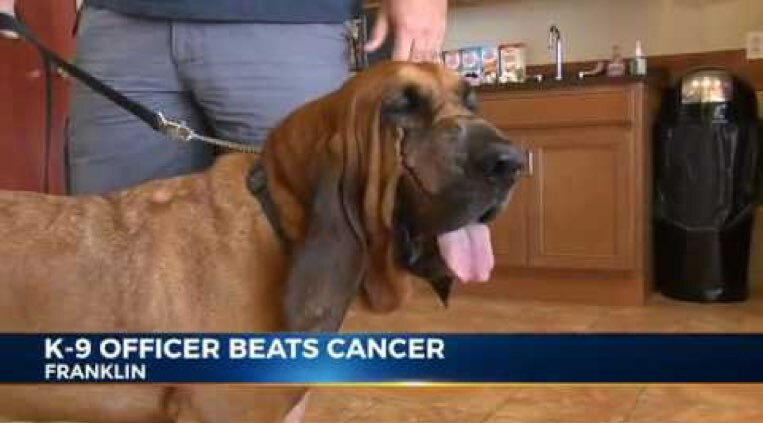 He helps cancer patients going through chemotherapy and radiation. But after all his work with patients, it was discovered that Conrad would be a patient himself. He had a nose bleed so they took him to the vet. After lots of different tests, it was found that Conrad had Osteosarcoma, a type of bone cancer that is not commonly found on the face. Because the cancer had not spread anywhere else, the vets were confident Conrad would make a full recovery. After four weeks of radiation with the support of his family at the UF Health Center, Conrad completed his battle and even got to ring the traditional bell cancer patients do when they are finished with treatment. One day Angel’s owners came across a lump on her belly. Initial tests came back as negative, but two weeks later after more tests she was officially diagnosed with cancer. It is one of the most common cancers found in dogs, but it also one of the most responsive cancers to treatments. While chemotherapy would put her in remission, a full recovery would require a bone marrow transplant. Her owners didn’t give up and held fundraisers to help raise the money necessary for Angel’s transplant. After twenty five weeks of chemotherapy Angel had her transplant. Three years later Angel is doing better than ever. She never gave up because Angel is a fighter. Bailey the Mastiff is a therapy dog that has had at least four hundred visits to nursing homes. She loves her job in helping seniors feel better and is probably around at least a thousand people a month. However, this time around Bailey needed some help. Bailey did not want to put her left front foot down, so they took her to the vet. It turned out to be bone cancer. Bailey had to get her leg amputated, but that did not stop her. Of course at first Bailey struggled to walk and kept falling down, but after a lot of rehabilitation she figured it out. She is enjoying life to the fullest and continues to do her work as a therapy dog. Do you know a dog that has survived cancer? Let us know and share your story below.